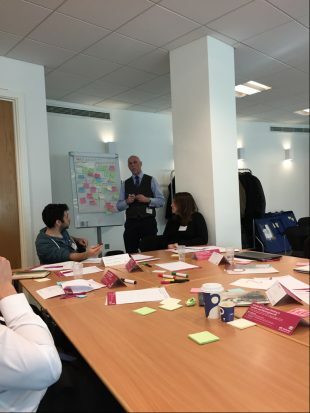 I was representing one of the organisations at the Birmingham brokering event for the NDA/Innovate UK competition – there’s £3 million to share out among organisations that propose innovative answers to some major decommissioning challenges at Sellafield. 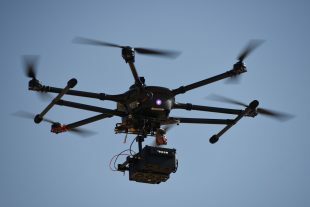 DroneOps is itself a small R&D company, relatively new and unsurprisingly specialising in drones or Small Unmanned Aerial Systems (SUAS) to be technically accurate, plus robotics. Our company doesn’t work in the nuclear sector at the moment but my own personal background is very much in the nuclear field, with many years spent on producing safety case assessments for operating and decommissioning sites. So we were interested to understand more about the Sellafield challenges and to chat to other organisations during the day, as we’re planning to form a consortium and submit a proposal. There was a wide range of specialist expertise at the event from virtual reality and robotics to radiation measuring, to drones (like us), packaging, space technology; then there were universities, large corporations, SMEs – a real diverse mix. The chance to obtain some funding for a collaborative research project is almost a dream come true for a small company like ours, with just seven staff: we absolutely believe in our capabilities and are confident we can bring something new to decommissioning but, like most small businesses, our resources are limited. What’s inside, how do we get to it, how do we clean it or cut it up, how do we sort and package it? We were left under no illusions about the challenges and the need for end-to-end solutions that will all fit together, but at the same time, it was fantastic to hear about the appetite to try new ideas and bring new players like ourselves into the sector. Further down the line, the opportunity to try out resulting technologies in a radioactive environment is also a huge benefit – it means any innovation will effectively be ready to deploy. It was also good to know that support and guidance are on offer from the Knowledge Transfer Network.